Today we scored another great piece of farm equipment for incredibly cheap. We visited Longview Country Store in Meredith, NH which if you’re a homesteader near here you should definitely visit. They sell, among other things, consigned antiques and tools many of which are perfectly usable and great for a homestead. On to the good part of the story. Today they had and Earthway Seeder for $7! I was amazed as they usually cost around $100 and this one came with a fertilizer attachment. It only came with one plate for sweet corn but it was still a steal. You can by a new one on Amazon with six plates. 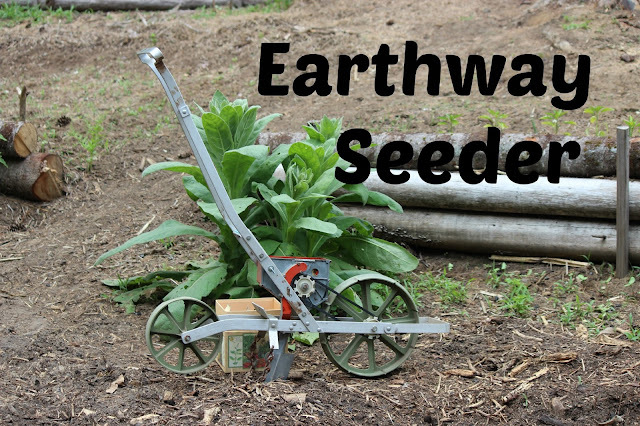 The Earthway Seeder makes a small furrow, drops seeds at a set distance, covers the furrow by dragging a chain over the dirt, and then packs the furrow with the back wheel. We got it home and immediately tested it, putting in a few new rows of beans. I already love it. It speeds up planting so much and because we want to continue to expand our garden it will definitely come in handy in the future.